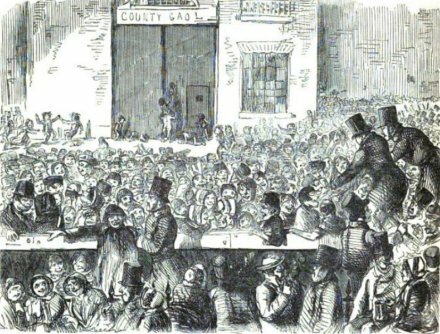 England held its last-ever public execution on this date in 1868, and made it big game indeed: Fenian Michael Barrett, whose Clerkenwell Prison bombing long remained one of the most infamous atrocities of the Irish nationalist cause. The bill certifying the end of that distinctive institution, the public hanging, would be finalized three days hence, so the occasion’s milestone was anticipated in advance. 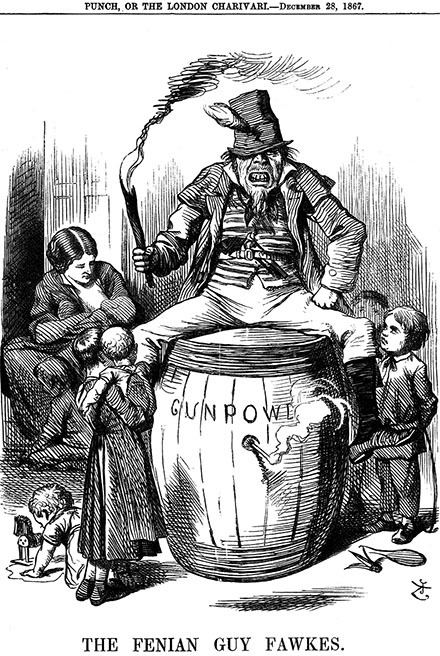 Elites increasingly disdained the boorish carnivals that unfolded under the gallows, like Dickens who complained that “no sorrow, no salutary terror, no abhorrence, no seriousness; nothing but ribaldry, debauchery, levity, drunkenness, and flaunting vice in fifty other shapes” redeemed the 1840 hanging of Courvoisier. “The Great Moral Lesson at Horsemonger Lane Gaol”, Punch magazine’s view of the notoriously rowdy mob at Frederick and Marie Manning execution. It is said that one sees on the road to the Derby such animals as are never seen elsewhere; so on an execution morning one see faces that are never seen save round the gallows or near a great fire. Some laughed, some fought, some preached, some gave tracts, and some sang hymns; but what may be called the general good-humoured disorder of the crowd remained the same, and there was laughter at the preacher or silence when an open robbery was going on. None could look on the scene, with all its exceptional quietness, without a thankful feeling that this was to be the last public execution in England. Towards 7 o’clock the mass of people was immense. A very wide open space was kept round the gallows by the police, but beyond this the concourse was dense, stretching up beyond St. Sepulchre’s Church, and far back almost, into Smithfield — a great surging mass of people which, in spite of the barriers, kept swaying to and from like waving corn. Now and then there was a great laughter as a girl fainted, and was passed out hand over hand above the heads of the mob, and then there came a scuffle and a fight, and then a hymn, and then a sermon, and then a comic song, and so on from hour to hour, the crowd thickening as the day brightened, and the sun shone out with such a glare as to extinguish the very feeble light which showed itself faintly through the glass roof above where the culprit lay. It was a wild, rough crowd, not so numerous nor nearly so violent as that which thronged to see Muller or the pirates die. In one way they showed their feeling by loudly hooting a magnificently-attired woman, who, accompanied by two gentlemen, swept down the avenue kept open by the police, and occupied a window afterwards right in front of the gallows. This temporary exhibition of feeling was, however, soon allayed by coppers being thrown from the window for the roughs to scramble for. It is not right, perhaps, that a murderer’s death should be surrounded by all the pious and tender accessories which accompany the departure of a good man to a better world, but most assuredly the sight of public executions to those who have to witness them is as disgusting as it must be demoralizing even to all the hordes of thieves and prostitutes it draws together. Yesterday the assembly was of its kind an orderly one, yet it was such as we feel grateful to think will under the new law never be drawn together again in England. Michael Barrett’s ticket to this last assembly was punched by a different execution six months previous — the hanging of the Manchester Martyrs. This trio of Irish patriots were part of a mob who liberated some comrades from a police van, shooting a policeman in the process — though it was far from certain that any of these three actually fired shots. Of importance for our purposes today was the crackdown on other Fenians occasioned by the Manchester affair. In November of 1867, a Fenian agent named Richard O’Sullivan Burke was arrested with his companion Joseph Casey in London purchasing weapons for the movement. They were clapped in Clerkenwell Prison pending trial. The bombing that brought Michael Barrett to the gallows was a bid to liberate these men … and it did not pause for subtlety. The conspirators simply wheeled a barrel of gunpowder up to the wall of the facility when they expected the inmates to be at exercise in the adjacent yard. The explosion blasted a 60-foot gap in the wall; the inward-collapsing rubble might easily have been the death rather than the salvation of the prospective beneficiaries, except that they weren’t actually in the yard at all — nobody was there, and nobody escaped Clerkenwell. But numerous working-class families lived in little tenements opposite the prison and were there, and in fact Clerkenwell had a reputation for political radicalism and Fenian sympathy. This monstrous new “infernal machine” tore through Clerkenwell homes, leaving 12 people dead and numerous buildings near to collapse, while windows and chimneys shivered to pieces all up and down the block. 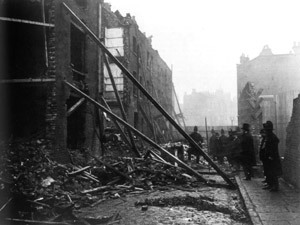 Improvised struts shore up damaged buildings opposite the wall of Clerkenwell Prison reduced to rubble by the December 13, 1867 Fenian bombing. English reformer Charles Bradlaugh agreed. “The worst enemy of the Irish people could not have devised a scheme better calculated to destroy all sympathy,” he wrote. Punch magazine depicts the Clerkenwell bomber(s) as the “Fenian Guy Fawkes“. Considering the magnitude of the crime, someone would have to pay for it. That Barrett was that someone did not sit well for many. Five men and a woman stood trial at the Old Bailey in April for the Clerkenwell outrage, but Barrett was the only one of them convicted, a terribly inadequate investigation/prosecution outcome given the infamy of the crime. The reliability and even the good faith of all such winesses might well be impugned. A highly questionable stool pigeon named Patrick Mullany who ducked prosecution by turning crown’s evidence, charged that Barrett personally set off the ordnance. To give me credit for such an undertaking is utterly absurd; being, as I am, a total stranger to acts of daring, and without any experience which would in any way fit me for engaging in such an enterprise. Is it not ridiculous to suppose that in the City of London, where … there are ten thousand armed Fenians, they would have sent to Glasgow for a party to do this work, and then select a person of no higher standing and no greater abilities than the humble individual who now stands convicted before you? To suppose such a thing is a stretch of imagination that the disordered minds of the frightened officials of this country could alone be capable of entertaining. If it is murder to love Ireland more dearly than life, then indeed I am a murderer. If I could in any way remove the miseries or redress the grievances of that land by the sacrifice of my own life I would willingly, nay, gladly, do so. if it should please the God of Justice to turn to some account, for the benefit of my suffering country, the sacrifice of my poor, worthless life, I could, by the grace of God, ascend the scaffold with firmness, strengthened by the consoling reflection that the stain of murder did not rest upon me, and mingling my prayers for the salvation of my immortal soul with those for the regeneration of my native land. Three months after Barrett made that expiation, England officially began its era of fully private hangings behind prison walls. Part of the Themed Set: Terrorism.